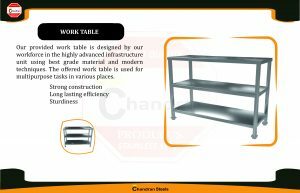 We are a unique entity in this industry, actively committed towards manufacturing a premium quality range of SS Work Table.We are a reputed entity in the industry, actively engaged in offering an optimum quality range of SS Working Table. SS Work Table in tamilnadu, Stainless Steel Work Table Manufacturer/Supplier in tamilnadu, Stainless Steel Work Table in tamilnadu. Our expertise lies in offering a wide range of SS Work Table support as per the specific requirements of customers. This custom fabrication support is offered using a variety of metals including aluminum, stainless steel, mild steel and others and meets customers’ complete fabrication and welding needs. Our expertise lies in offering structural support for processes involving transportation and others as well as also meeting the demands of complex manufacturing assemblies, heavy processing equipment, material handling systems and others. We offer complete support for creation of a complete industrial process to meeting fabrication requirements of the single component. chandran steels was established in the year 2000 with the aim of become a leader in the field of ovens and other bakery equipment. We have been able to establish ourselves as a major manufacturer of gas convection ovens and food mixing machines. We serve our customers with a wide range of products that include Bread Slicer, Planetary Mixer, Spiral Kneader, Electric Rack Oven, Storm Convection Oven, Diesel Rack Oven, Diesel Rack Oven, Pizza Oven etc. Our aim is to create such high standard products that we become a benchmark in the field of Kitchen Equipments. All our products are in adherence to various quality and safety standards. Further, we strive to ensure that all our products are energy efficient with lowest possible power consumptions. With the superior quality and features of our products, we have been able to maintain ourselves as a trusted name in the industry with a wide network of loyal customers based all across the nation.